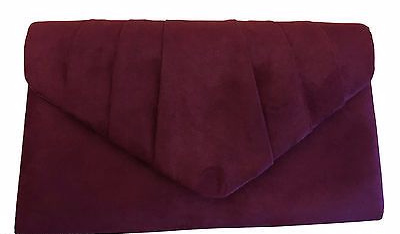 Purple / burgundy coloured clutch / shoulder bag, luxurious velvet fabric with an embroidered style floral pattern in light gold thread, silver coloured sequins and a light gold coloured metal trim, beautiful quality and looks truly stunning ! The bag fastens with a flap over the top and a concealed metal magnetic stud, it has a detachable metal chain shoulder strap for two different looks ( the chain measures approx. 46 inch / 115 cm in total length ). Measurements : approx. 8.75 inches / 22 cm wide, approx. 5.75 inches / 14.5 cm high and approx. 2.5 inch / 6 cm in depth.